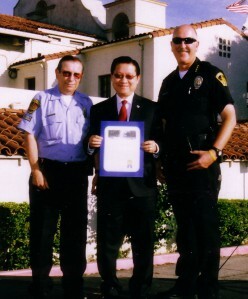 Crime Prevention Officer Alex Acosta, Assemblymember Mike Eng and San Gabriel Police Chief David Lawton helped kickoff the city’s “17th Annual National Night Out” on August 2. Officer Acosta welcomed everyone to this special event. They had 40 Neighborhood Watch Block Parties to attend. 130 city personnel would be attending the various parties. Have a good time. He introduced Chief David Lawton who welcomed everyone and stated the city has over 2,800 members in the Neighborhood Watch Program. 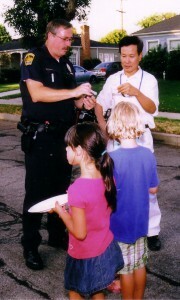 Tonight you get to meet your neighbors to help prevent crime. 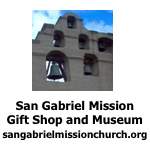 Assemblymember Eng spoke about his late father’s business in Honolulu that was a Levi Strauss store. He went door to door in the neighborhood to interest people in buying his product. 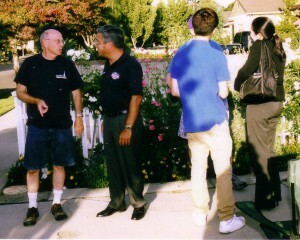 He compared National Night Out to going door to door to present your product. You must go out to the people. He complemented Police Chief Dave Lawton and his staff and the Council for the good job they are doing in the community. 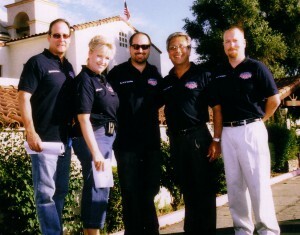 Councilmembers Mario De La Torre and Juli Costanzo, Vice Mayor Kevin Sawkins, Mayor Dave Gutierrez and Councilmember John Harrington were joined by City Manager Steve Preston, Assistant City Manager Marcella Marlowe, Fire Chief Joe Nestor, Community Developer Director Jennifer Davis, Public Works Director Bob Bustos, Parks and Recreation Director Rebecca Perez, San Gabriel Mission Playhouse Manager Anna Cross, Public Information Officer Johanna Ambricki, 98.7 The Kiss FM, Ron Ingles from the District Attorney’s office, Colleen Oinuma from Congressmember Adam Schiff’s office, Matthew Wong from Senator Carol Lui’s office, Henry Lo from Assemblymember Mike Eng’s office and members of the U.S. Army, U.S. Navy, U.S. Marine Corp and U.S. Air Force. Mayor Gutierrez congratulated Alex Acosta on this 2011 Night Out and thanked everyone for their participation in this event. 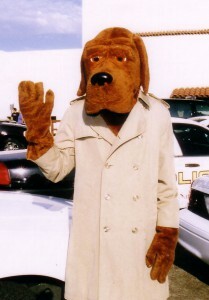 McGruff and his friends Larry and Vince joined the party. 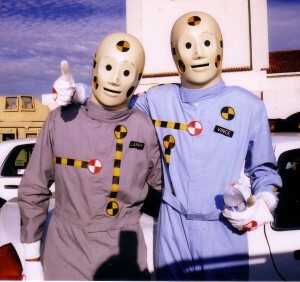 They reminded everyone to take a bite out of crime and to drive safe. 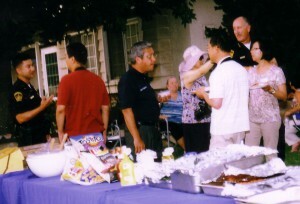 Mayor Gutierrez met with several residents at one of the many block parties. Police officers passed out baseball cards to children of all ages. The police officers and firefighters also passed out glow stick bracelets and badges to the public. 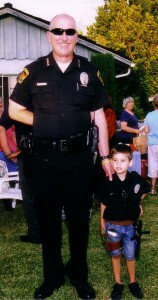 Junior Police Officer Joaquin Belmont joined Police Chief Dave Lawton. Children with their parents had a chance to get up close and personal with the safety vehicles. Members of the City Council, city staff, Police, Fire and Public Works Department as well as members of our military visited each block party. The food was diverse as the neighborhoods. 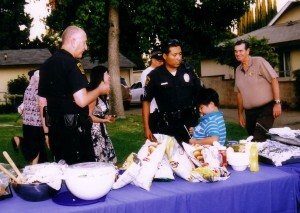 Monterey Park celebrated National Night Out in front of City Hall with a bar-b-cue hosted by the Police Department and sponsored by Farmers Insurance. 300 people attended the event and enjoyed the good food and listen to safety tips from the Police Department and the City Councilmembers. 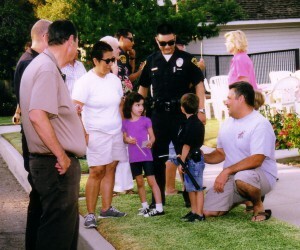 Rosemead also celebrated National Night Out with hundreds of other cities throughout the United States.